Got my hands on one and wasn’t disappointed! I bought a p-07 in February. I've put 800 rounds through it and it's been flawless and super accurate right out of the box. The trigger on mine is great with no mods done and none planned. I replaced the front sight with a DP FO. I handled the p-07 a bunch of times but didn't shoot it before I bought it. I rented a P-07 at a local range before I bought my first one. I was initially really impressed with the single-action, but my double-action accuracy was pretty dismal, coming from experience with striker-fired pistols mainly. I bought my first one at a local big box retailer in 2017 without dry-firing it, and my second one sight unseen from an internet gun seller in 2018, and I guess I got lucky both times. After lots of DA practice, dry and live fire, and a lot of CGW enhancements to both, they are both some pretty awesome shooters with smooth DA pulls and SA pulls without creep. The springs, DA rollers, and hammers from CGW made a huge difference in both of them. I just went to the range again with my 'less than a month old" OD Green baby. I installed the CGW extended firing pin and 18# main spring after polishing the trigger bar, safety block and other internals. It's a hell of a pistol and a pleasure to shoot. I have big hands and the P07 fits nicely in my mitts. I'm very happy with my purchase and look forward to adding another CZ in the future. I'm not familiar with that term "in the white". Can you explain further? Price, I've seen these for sale both online, and in LGS's for under $500, quite often, that's a baragin.. I got my OD Green for $520 out the door. The term " in the white" means the metal is left with no finish..no bluing, black oxide, etc nothing.. in this case, CZ finish chambers the barrel using a reamer, probably a small amount of metal is removed, and it is left with no protective finish on it. 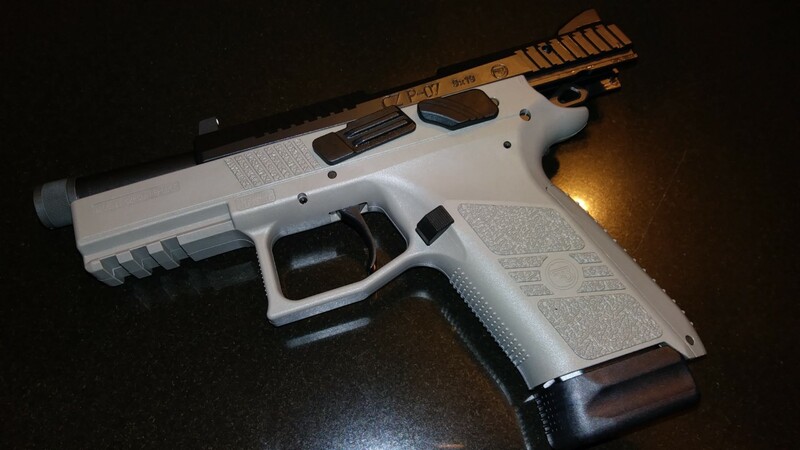 IMO, a bad idea for a carry gun ..Note that Glock, HK, even S&W Black nitrides their barrels AFTER all the machining operations are done, Black nitride goes by several different names, but basically, it's the same process..HK, calls it their "Hostile Enviroment" finish, S&W calls it "Melonite" and Glock has used "Tennifer" while not rust proof it is however very,very rust resistant, and not a bad idea www.blacknitride.com these folks have done some CZ pistol barrels for me, as well as a entire pistol, my "SP01 compact" I had the frame, slide, barrel, saftey levers, done..it turned out great..
Mines been ordered and shipped today. Should be in Friday. Will get to shoot it for the first time as my wife shoots her new M17 for the first time also. Should be a fun day. This post also got me thinking about a P-07. I've been thinking about them for a while, but for some reason something else always follows me home instead. But no more. I brought this beauty home yesterday. Don't understand why I didn't do it before. Nice! I struggled hard deciding between the urban gray and threaded barrel vs standard black and ended up ordering black. Pretty sure if they would have had the urban gray in store that would have came home with me as well. On the metal framed pistols the frame and slide are urban gray. I wonder why the plastic framed pistols come with a black slide? If I had to guess, it'd be that the P07/09 and P10 slides are all black nitrided, where as the metal framed guns are polycoated..one can mix polycoat up in several different colors, as it is basically a sprayed on finish, Black nitride? You can have any color you want, as long as it's Black.. Considering the rust resistant properties of Black Nitride, I'd rather have that.. The CZ black nitride is superb! Much better than polycoat. A comparison of the P-07 and the M-17 would be interesting. Could you follow up with a range report and Pictures? Will do my best to get those up tomorrow. I’m blessed guys, it’s my anniversary and my wife wanted new pistols and a range trip! I’ll shoot them both and report back. First two mags from 7 yards. So far I’m in love. I’m sure those groups will start shrinking in time. Better than my first two mags with my P-07. 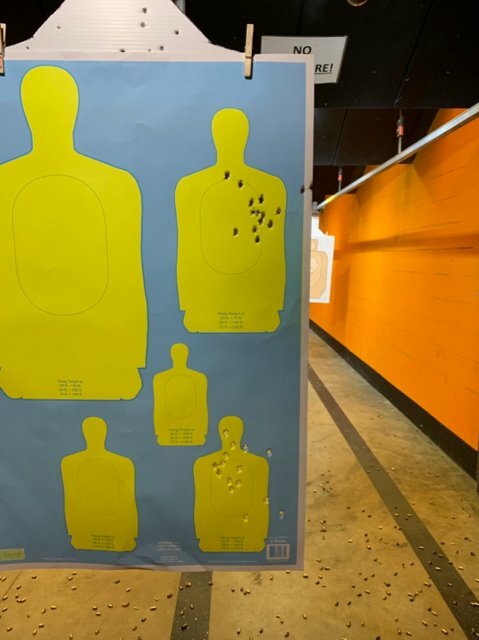 Thanks for posting your first range trip for the group.